When Radio 4’s Broadcasting House launched an appeal for lost recordings of Alistair Cooke’s Letter from America, last October, no one could have imagined that it would lead to over 620 missing programmes being restored to the BBC’s archive. Fortunately two listeners - Roy Whittaker, from Cornwall, and David Henderson, from Warwickshire, heard the programme and contacted Broadcasting House. They both loved listening to Alistair Cooke and recorded Letter from America every Friday night for years. But unlike other people who got it touch, they had also labelled the tapes with dates, and stored them safely in boxes - one in his attic, the other in his cellar. 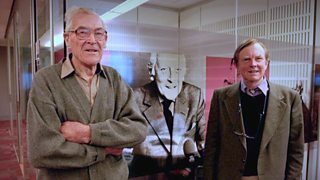 Mr Whittaker and Mr Henderson entrusted their collections to the BBC and as a result helped complete the Letter From America archive between the years 1974 to 2004. The BBC’s Information and Archive Team recently finished digitising over 600 of their recordings. To celebrate, we invited them for a special lunch and a tour of Broadcasting House with presenter Paddy O’Connell to say thank you. Paddy sneakily managed to type a brief thank you note to them on Alistair Cooke’s typewriter, displayed on the first floor of New Broadcasting House. Digitising the collections wasn’t straightforward - some were recorded on long obsolete 8-track tapes. Restoring the machine on which they’d been recorded by David Henderson, back in 1974, proved the only solution. The majority were on cassette tapes – but the levels varied considerable according to the brand of tape, so it was painstaking work. And there’s plenty of more work to do – the audio needs restoring, descriptions need writing, but one day we hope to find a way to make them available to the public, along with the 920 Letter from America programmes currently available to listen or download. And if you know anyone who recorded Letter from America before 1974, please get in touch. The BBC Radio team explain their decisions, highlight changes and share news from all of BBC radio.